2012 Kawasaki Brute Force 300. Picture credits - Kawasaki. Submit more pictures. 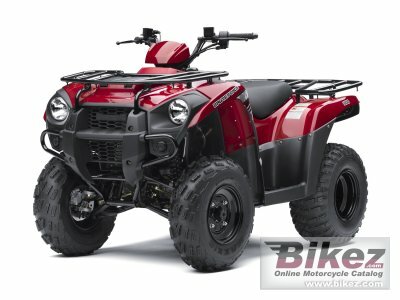 Replacing the venerable Bayou� 250 in Kawasaki�s highly acclaimed ATV lineup, the Brute Force 300 offers wide-ranging utility and sporting capability in a surprisingly affordable package. Here�s an all-around ATV that�s not only loads of fun to ride, but also delivers a high degree of work ethic and everyday versatility, whether you�re fence-fixing on the farm, plowing snow or trail-hopping with the family. Ask questions Join the 12 Kawasaki Brute Force 300 discussion group or the general Kawasaki discussion group. Click here to sell a used 2012 Kawasaki Brute Force 300 or advertise any other MC for sale. You can list all available Kawasaki Brute Force 300 bikes and also sign up for e-mail notification when such motorcycles are advertised in the future. Ads with or without pictures are easy to create. Our classifieds are completely free with sections for every country in the world. You can also check out our list of related motorbikes. Compare technical data. Look at photos. View your fellow riders' rating of the bike's reliability, design, engine performance, accident risk, repair cost, etc.